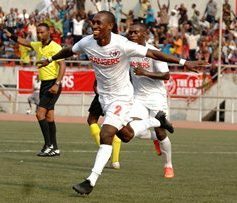 Former Super Eagles striker Jude Aneke has expressed belief that both Lobi Stars and Enugu Rangers will advance to the quarterfinals of the CAF Champions League and Confederation Cup respectively. Lobi host Wydad Casablanca today at the Nnamdi Azikiwe Stadium, Enugu while Rangers host Malian side Salitas FC in same venue on Sunday. Lobi are in Group A of the CAF Champions League and also have Mamelodi Sundowns and ASEC Mimosas as opponents while SX Sfaxien and Etoile del Sahel make up the other teams rivalling 'The Pride of Benue'. Aneke, a former league top scorer in the Nigeria Professional Football League spoke to allnigeriasoccer.com on the continental campaigns of both Nigerian representatives. "Both clubs, Lobi and Rangers International are in a strong group so it will not be easy really. "They have started their group matches in impressive fashion. They were drawn alongside tough teams but with determination, they will definitely qualify into the quarter finals," Aneke enthused.